The Comey Memos Look Awful for Trump. Why Did Republicans Release Them? We truly live in the dumbest of times. Before we dig into the meat of the James Comey memos, let’s take a quick trip down memory lane to find out how we got here. — James Comey wrote memos in the wake of his conversations with President Trump in 2017, detailing the contents and his impressions of these interactions before he was fired as FBI Director. — These memos were obtained by the investigatory bodies surrounding the Russia inquiry, and yesterday, it finally hit the House Intelligence Committee. — Upon landing in Devin Nunes’ hands, these memos hit the press almost immediately. This was very clearly a Republican leak by Trump allies. — These memos do not look good for Donald Trump. Devin Nunes and his lemmings pressured Deputy Attorney General Rod Rosenstein to release James Comey’s memos. It’s mind-blowing that they could look at these and think that they reflect positively on the president. Especially in light of James Comey’s interview where he called Trump “morally unfit” to be president. What did they think these were going to be? A bunch of doodles of Comey and Trump romping thorugh a field of daisies? They also make Reince Priebus, Trump's former Chief of Staff, look like a complete and utter buffoon who was trying to interfere in an ongoing counterintelligence investigation. By far the most damning portion of James Comey's memos is how aware he says the administration is of Michael Flynn's, well, problems, shall we say. So why did Trump's lackeys in the House leak this? Did they read it? Are we even sure that Devin Nunes knows how to read? This is so crazy. Of all the crazy things to happen since Trump became president, the House Republicans thinking that James Comey's memos made Trump look innocent is the most baffling. Slate's Jeremy Stahl has the only explanation that makes any real sense, and it's still unfathomably stupid. 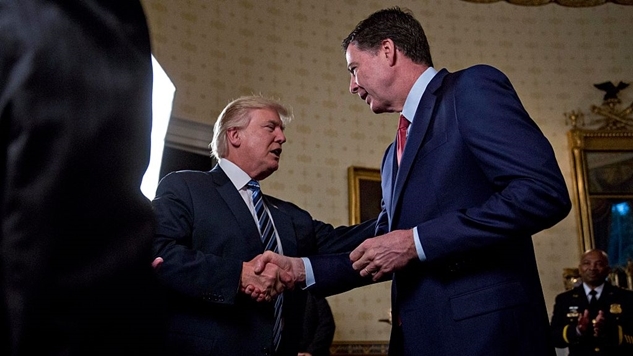 According to press reports, Professor Daniel Richman of Columbia Law School stated that Mr. Comey provided him four of the seven memoranda and encouraged him to “detail [Comey's] memos to the press.” If it's true that Professor Richman had four of the seven memos, then in light of the fact that four of the seven memos the Committee reviewed are classified, it would appear that at least one memo the former FBI director gave Professor Richman contained classified information. Professor Richman later read a portion of one of the memos to a New York Times reporter. Notice how Richman explicitly said none of the memos he received were classified and that they remained unclassified? And notice how that portion was in quotes. Now, notice how the part about Richman receiving “four memos” was not in quotes, but rather Fox News' description of what it says the organization was told? So Republicans took an inaccurate and misleading Fox News report at face value, and launched an entire investigation around a spurious allegation, which led to more details about what Trump and his cronies knew about Michael Flynn—a man who has pleaded guilty to lying to the FBI over his communications with the Russian ambassador. Congratulations Republicans, this is an impressive own-goal, even by your hilariously low standards. Keep in mind that may not be the case. It's simply the best theory for an inexplicable turn of events. Another, more sinister theory is that Republicans see the writing on the wall in the Mueller investigation, and are simply giving Trump what he wants—even though they know it will ultimately lead to his downfall. Trump essentially told us his motivation for releasing these memos on Twitter last night, as he tried to pivot the conversation away from the array of Flynn revelations contained in these memos (not to mention the anecdotes about Putin). The memos do not “show clearly” that there was NO COLLUSION and NO OBSTRUCTION. They just don't say anything about them either way, so I guess technically he's not completely wrong. Remember, these memos were written in January 2017—or in Trump years, 4,000 millennia ago. Plus, James Comey told George Stephanopoulos that “collusion” isn't even a real term to him. It's an invention of the media to describe a complex series of events. It has absolutely no legal definition in this case. Lastly, Comey didn't write anything specifically addressing obstruction (because it was literally the start of the presidency)—but the holes in the story that his memos fill sure do paint a timeline of exactly that. Remember, Trump was inaugurated on 1/20/2017. Here are his first three weeks in office. The big takeaway from these memos is that the White House absolutely knew that the intelligence community was raising the alarm bells about Michael Flynn prior to firing him in the wake of The Washington Post's report about Flynn's secret calls with the Russian ambassador (which was likely the reason why people like Sally Yates raised so much hell over his presence on the National Security Council). Given the concerns raised about Flynn in these memos, it sure seems like the FBI has him nailed on more than just lying to them. If that is the case, Flynn got an amazing deal from the Department of Justice, and the only way that happens is if he's giving the Feds a lot of what they're looking for. Again, that would mean that Trump is likely a target of this investigation, because when you combine it with reports that Mueller is trying to flip Paul Manafort, there just aren't that many people higher up on the food chain to flip than the National Security Adviser and Campaign Manager. This is all so insane. Not only did this stuff, yannow, happen, but the people behind this madness think that revealing more information about an ongoing criminal investigation into the Trump camp's nefarious activities will actually help them. On top of all this, the orange hobgoblin the Republicans are following in lockstep is still defending a man who pleaded guilty to lying to the FBI. So General Michael Flynn's life can be totally destroyed while Shadey James Comey can Leak and Lie and make lots of money from a third rate book (that should never have been written). Is that really the way life in America is supposed to work? I don't think so! Michael Flynn is radioactive. Anyone with one functioning neuron in their brain would have fired him into the ionosphere the moment the campaign was over, but these nitwits decided to give an unstable and likely compromised man access to America’s most tightly kept secrets. Now, the law is hot on their trail, and they think that leaving breadcrumbs leading up to their hideout is a good thing. Not only is the Republican Party wholly anti-democratic, but it’s clear now that they oppose the very concepts of logic and reason. This entire ordeal is the dumbest thing that has ever happened.